It’s Just a Bunnypalooza champions the power of imagination to bring people together. Third in a series for three- to six-year-olds, It’s Just a Bunnypalooza sees Lizzy returning for a lesson on staying true to her instincts. Brenda Faatz and Peter Trimarco use onomatopoeia and a sprightly lead to inspire kids with the joy that comes from standing out for the right reasons. Home from school, Lizzy is eager to tell her animal friends about the Spring Jamboree, which features a talent show. Lizzy considers choices such as hooting like an owl and flapping like a hummingbird, but then she spies rabbits dancing. When she tells her classmates that cottontails are teaching her to dance, she’s met with laughter. A chagrined Lizzy decides to stop playing make believe—until the rabbits intervene, lifting her mood so that she can get back to her usual self. This straightforward, encouraging story ends with a dance that puts everyone in a conga line with Lizzy. The book calls to its audience to embrace their passions, no matter how others respond. Illustrations evoke comic strips and display expressive humor. Lizzy, who is dressed in overalls and sports untameable orange hair, is an appealing, bighearted character with plenty of spirit. Her playful personality comes through in scenes where she rolls on her desk in anticipation or hangs upside-down from a tree. When the rabbits, whether they’re real or imagined, step in to renew Lizzy’s confidence, it’s uncharacteristically indirect. As much warmth as there is in Lizzy finding unexpected help, and as valuable as it is to see her decide when to accept it, the plot hints that Lizzy is a girl who needs rescuing, rather than one who can solve her own problems. This feels at odds with Lizzy as she’s first presented––as a girl who’s all verve and individuality. Occasionally awkward phrasing and unsurprising rhymes make this an uneven read-aloud. The book retains the signature inventiveness found in earlier volumes, though, bringing back delightful word-play with “bunnybombastic,” “jigga-wiggalous,” and “ballet-hoo.” An informative glossary offers background information on the dances of the rabbits’ selections, including the fandango and mazurka. 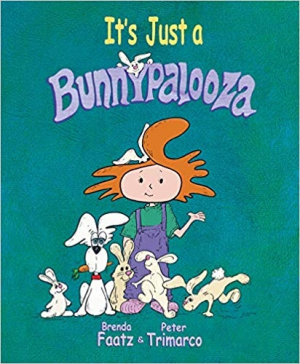 With artful drawings, a quirky character, and its celebration of movement, It’s Just a Bunnypalooza champions the power of imagination to bring people together.